It’s just pretend…but nobody wants to stop. 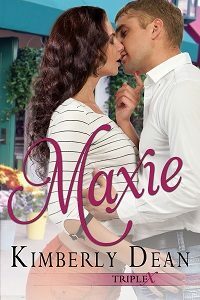 Maxie’s quiet, predictable routine is shattered when she steps outside her flower shop and almost runs into two women. It’s not the near collision that’s startling. It’s the strangers’ faces. It’s like looking in a mirror times two, and it sends her into a dead faint. Sheriff Zac Ford sees three identical copies of the woman who’s caused him more sleepless nights than he can count, and it stops him in his tracks. Maxie’s buckling knees snap him out of his trance, and he catches her before she hits the cement. Two sisters she never knew she had? Maxie can’t deal with this turmoil, not on her own. She needs a shield, a rock. For the first time in her life, she takes a wild leap of faith. When Maxie calls him her boyfriend, Zac has no trouble playing along. It’ll give him time to figure out what these “sisters” want. Soon, though, for-show kisses get hotter and playacting touches grow bold. And Maxie must choose to stay in her safe little world, or grab life by the horns. It’s time for this identical triplet to meet her match. Can a wild child ever really be tamed? Growing up in foster care has made Roxie Cannon tough and self-reliant, but being alone isn’t all it’s cracked up to be. She’s finally found family. Is it time she met her match? Roxie should be on top of the world. She’s formed bonds with identical sisters she never knew she had, and she’s buying the bar she’s managed for years. The feisty brunette has everything she’s ever wanted. Almost. Two things still elude her: answers to why her family was split apart, and a man with whom she can share her passion. Seeing her sisters with their mates has made her aware she’s still the odd one out. Yet that all starts to change when a rough-and-tumble hottie from her past walks in The Ruckus’ door. Billy knows trouble when he sees it, and Roxie is commotion in motion. They’ve always set sparks off one another. This time, he’s promised himself he won’t get burned. Yet things get serious when he learns of Roxie’s quest to find her parents. Can he save his hot-blooded lover from being hurt? Or will the wounded little girl inside her never trust him again?